From organic and vegetarian food to certified cosmetics, from body to mind disciplines, from vegetable fibers to ecological and eco-friendly home and personal care accessories. 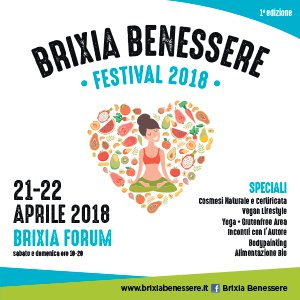 The first edition of BRIXIA WELLNESS FESTIVAL gives space to each of these areas, presenting a rich offer of theoretical and practical experiments, accompanied by the presentation and sale of products and services with over 200 companies from all over Italy. The exhibition space will host the relax area with over 500 free massages and treatments, performed by experienced shiatsu practitioners, holistic massage, Jin Shin Do acupressure and foot reflexology, yoga area and bodypainting, where the first BRIXIA Body Painting Contest, will be launched. The salon dedicated to clothing, natural nutrition, cosmetics, body and mind disciplines.